The single extant species of this taxon is the long-legged Secretary Bird, Sagittarius serpentarius, which occurs in sub-Saharan Africa and predominantly feeds on snakes. 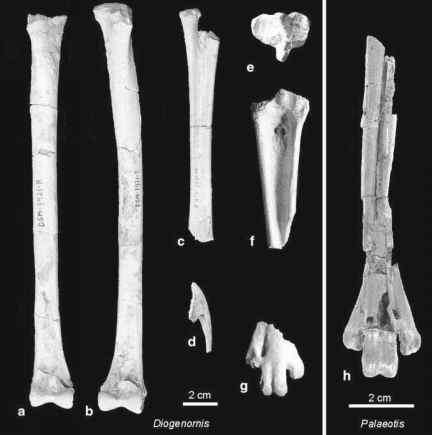 Pelargopappus schlosseri (Gaillard, 1908), a stem group representative from the early and late Oligocene of the Quercy fissure fillings, is smaller than S. serpentarius, and is based on hindlimb elements and a referred ulna. It has greatly elongated legs and also otherwise resembles extant Sagittariidae in the morphology of the known bones. However, the tar-sometatarsus has a more strongly developed trochlea for the second toe and a more pronounced medial hypotarsal crest, which by outgroup comparisons with the Pandionidae and Accipitridae probably represents the plesiomorphic condition for the Sagittariidae (Mayr 2005a).